So Spring sprung and then it shrunk. Then it sprung up again. Now it seems to have shriveled back down once again. And no this isn't a slick segue into the fact that we just brewed our second batch of Ol'Woody Alt, cause that would be down right crass...although we did just brew it last week. So yeah, I'll take the crassness and move on (also, keep an eye out for Ol'Woody, he should be springing up in awesome beer pubs early next month!). Truth is I'm just bemoaning the lack of consistent, solid weather. Mother Nature has been down right bi-polar this year. But this is Canada and really, we should kinda expect it. Or at least just shut up and take it. And take it we shall. Cause rain or shine or wind or snow, it's the Spring Fest at The Only Cafe this weekend! So grab your shorts and sandals, or possibly Kodiaks and snow pants, cause either way, we be drinkin'! And if that list of awesome craft breweries is not enough to entice you to come, well listen up. Sawdust City is going to be releasing their 2nd seasonal at this here Spring Fest. 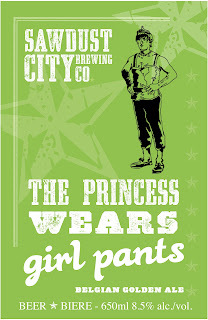 That's right, The Princess Wears Girlpants will be making it's first appearance. Well, actually 2nd appearance. We did release a cask of it for last weekends wonderful IPA Cask challenge at barVolo (which woulda been a whole bunch more wonderful had our cask of Lone Pine not exploded! Cursed casks!) as part of Friday's fun night of festivities. But honestly, this is a Belgian Golden Ale and it needs to be drank in it's proper fully carbonated form. All dolled up and dressed to kill, The Princess Wears Girl Pants is an 8.5% Belgian Golden, loaded with Motueka, Galaxy and Nelson Sauvin hops. Don't believe me. Well check out this here poster and see for yourself. Now before you go gettin' any cockimamy ideas about the origins of this beer handle, lemme just tell you, this beer done come by it's handsome moniker quite honestly. Named after two of my very dear friends, Princess & Girlpants, this here ale is somewhat of a hybrid beer. A special brew, I believe would be enjoyed by both equally. 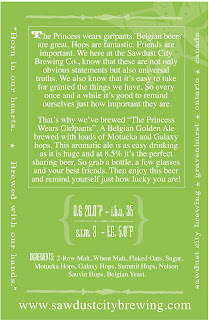 You see Princess ain't too fond of big, hoppy beers, he like his pints to be easy drinkin' and not too harsh. But Girlpants on the other hand, he done love his hops. He want an aggressive, in yo' face, gut punchin' pint. So I figure the best way to give them both what they want was to create an easy drinking 8.5% dry hopped Belgian, usin' only the juiciest varieties of New Zealand hops. Don't believe me. Well read this here back label a see for yourself. So yeah, maybe at first blush the names of our seasonal and one-off beers at the Sawdust City Brewing Co., may seem silly and outlandish, cause well...hey they are. But there is method to our collective madness. 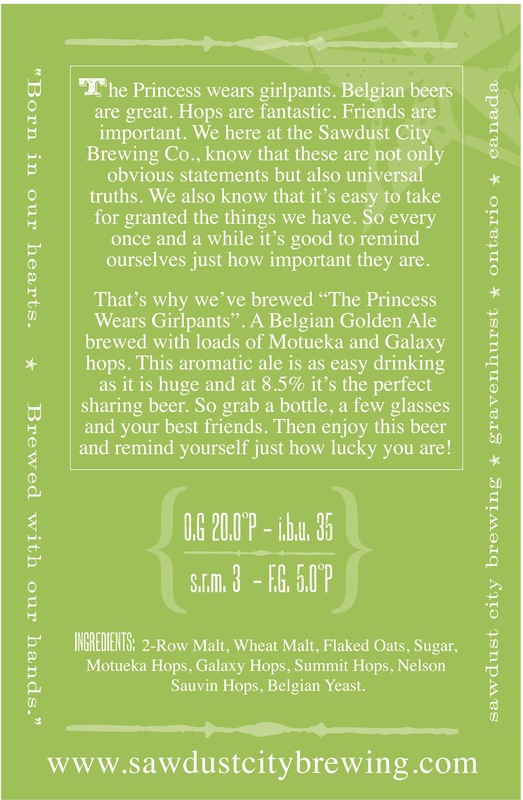 Each of our beers, each of our names, and each of our labels, has in it, important details from the lives we live. Be it intimate details about the town we live in, the family and friends that populate our lives or just the books and artwork that have been important to us over the years. We want to honour all those things and the best way we know how, is to make a beer with a silly name about them. Cause in the end, it's just beer folks and it should be fun. Well that's that. So what else is new? Well lots, but that's gonna have to wait. It's a busy time for the Sawdust City Brewing Co., as we're all off to wild south west. We're all headin' down to San Diego for the Craft Brewer's Conference next week. A great event that may or may not prove to be my own personal Waterloo. Last years conference in San Fran almost did me in and this year my brother is going. Not good. Wish me luck. If I do make it out alive, I promise to bring back tales of beer glory and wonder. Until then, everything will have to wait.